Starting from your police record (if you have any) to physical verification, the Home Ministry wants to soon move the process online, reducing bottlenecks and speeding it up. New Delhi: The painful passport verification process - often involving bribing local police officers who confirm your address and identity - could soon be simplified to just a few clicks. Starting from your police record (if you have any) to physical verification, the Home Ministry wants to soon move the process online, reducing bottlenecks and speeding it up. Officers with hand-held devices will then show up at doorsteps to perform the verification. 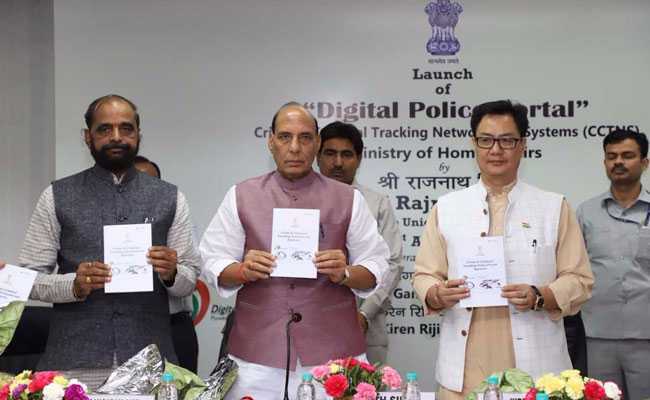 The step will come as part of the Home Ministry's programme called Crime and Criminal Tracking Network and System or CCTNS. The procedure which now takes weeks would take only a few minutes once this system is introduced. Union Home Minister Rajnath Singh officially launched this programme today. Starting today, you can perform tenant verification or register complaints online on this system. "If you see a hit-and-run case all you have to do is register yourself on to this portal and register a complaint. Even if you don't remember the entire number of the car, whatever you remember would be of use," union Home Secretary Rajiv Mehrishi said. The Ministry would be providing nine citizen services through this portal, that is, anything that needs a record check could be done from the single portal service. Your driving license and vehicle registrations would also be done online. Packaged for the public as Digital Police, the services under, CCTNS will be available at DigitalPolice.gov.in. All records related to any person over courts, trials and prisons would be available online. "It would enable our police to get quicker results," added Mr Mehrishi. According to the ministry, nearly 14,000 of the some 15,000 police stations in all are entering data into the CCTNS software. About 136 lakh FIRs have been entered using the software. And 5.8 crore old crime records have been digitised. "India is one of the few countries who have this kind of database," Additional Secretary TVSN Prasad who looks after policy matter in the Ministry told NDTV. According to him, since India is a country with multiple languages, the CCTNS software programme has been developed to recognise 85 languages. "Though the basic programme has been taken from open-source code, there is an inbuilt security data in the system," said Ashok Prasad, a Home Ministry advisor on cyber security told NDTV. According to him, the National Critical Information Infrastructure Protection Centre (NCIIPC) is also going to audit the programme periodically.